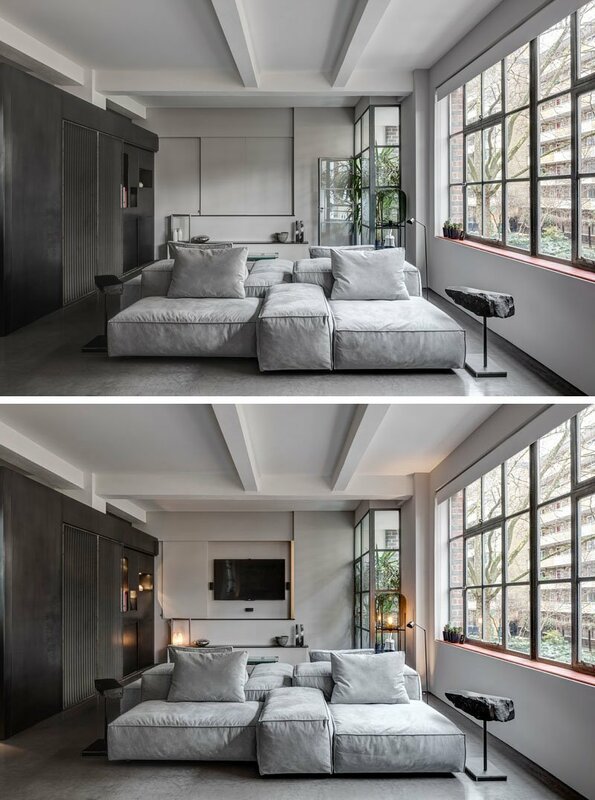 You wouldn't expect that this beautiful apartment was once a shoe factory! Without a doubt, the interior design of a home can be influenced not just by the owner’s choice but also by many other factors. This may include the trend in the location, the history of the location or even the original usage of the spaces if the area is a mere renovation. 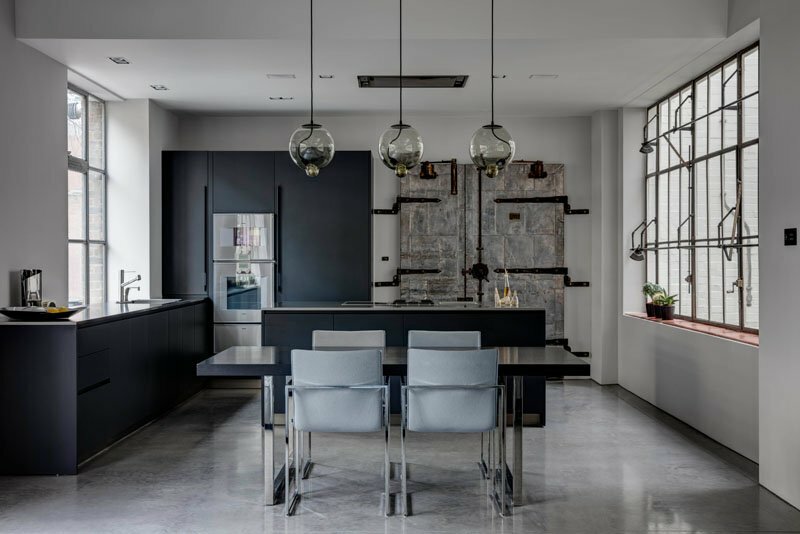 In many cases, when a space is once a factory, the interior would usually have an industrial feel because of the nature of the home’s architecture. This is what happened to the industrial apartment we will feature today. Originally, the building was built in the 1930s as a shoe factory. But today, it was transformed into a very nice apartment. The clients were drawn to the expansive windows of the structure, though the old arrangement of rooms meant that these were always partially hidden from view. 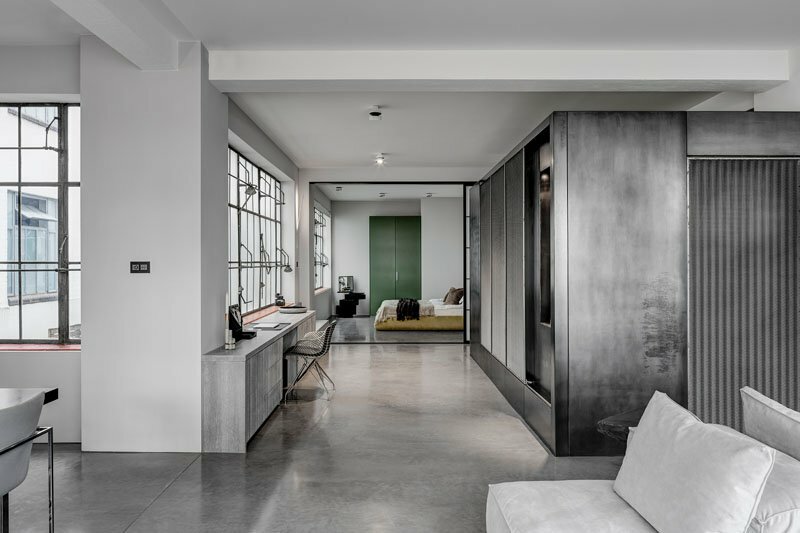 The project brief was to transform the warehouse space, while taking close consideration of the scale, grain and detailing of the existing architecture. Another goal is to create something very personal to the homeowners while representing something of their histories. One of the owners has a film background and he found the roughness and authenticity of the old factory very appealing. The project is urban in complexity yet strangely archaic /prehistoric in its base simplicity. 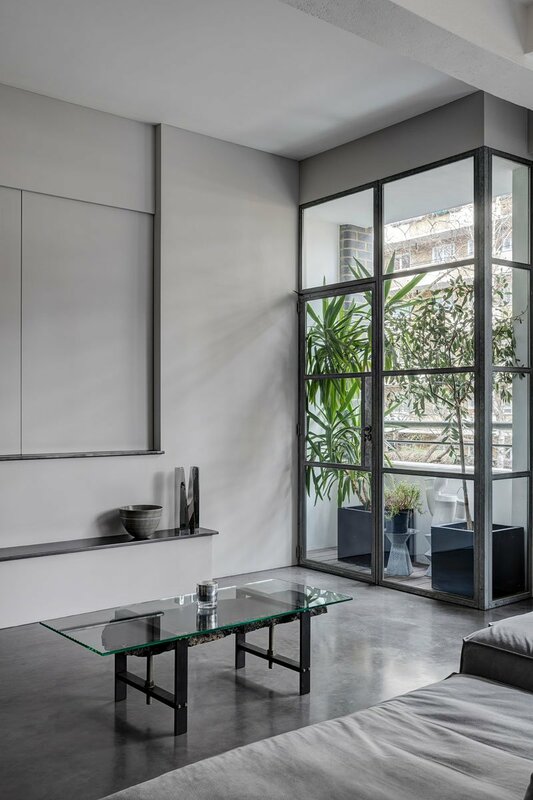 When you look in the interior of the apartment, it is dominated by a black steel cube which reflects the inhabitant’s passions and their love for material quality of an elemental nature. Let us take a brief virtual tour of the house through the images below. 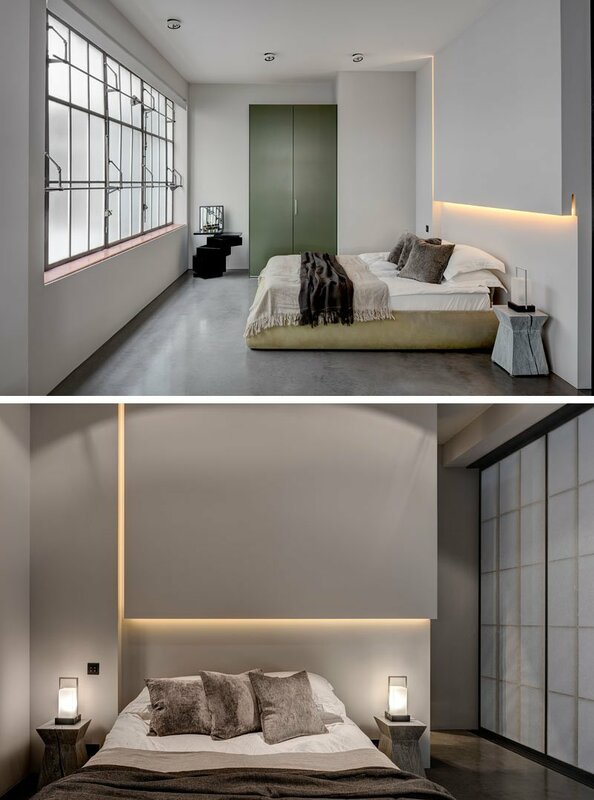 Unique feature: Once a show factory, it now stands as a beautiful industrial apartment. Each element serves a purpose in the movement to reveal a use of space that is compact and deliberate or occasionally obtuse and irreverent. 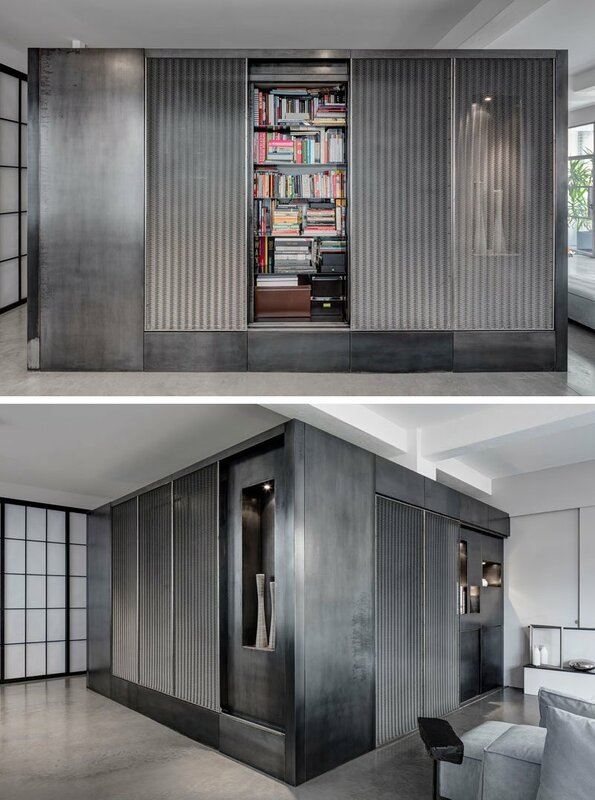 Springing from the clients love for theater, dance, music and artistic clarity, a monochrome palette became highlighted by gentle warm tones of light, delicate introductions of industrial steel blues, rich dark olive green and unexpected textures. The choice of materials, furniture, and moveable wall screens is deeply personal, inspired by family history as well as evoking memories of journeys in Japan, Belgium, and Argentina, each captured by fragments (solid oak shelves, black ash shoji, thick black marble splinters, mountain climate blankets & throws) that combine to create a dark mystical dream at night or a textural landscape in daylight. The black box sets about a pattern of architectural movement so that the spaces wrap around it. Each side of the cube is characterized by a different function: reading & sleeping / working, preparing food & dining / socializing & relaxing. The whole space is, however, a continuous wrap. The dining area looks very neat with the sleek modern touches in it. But you will still see some industrial features in it that will make you fall in love with it even more. If you loved that rock side table seen on the first image located in the living room, you will also like this coffee table version with an added glass top. Also seen here is a glass door that has access to the porch of the house. 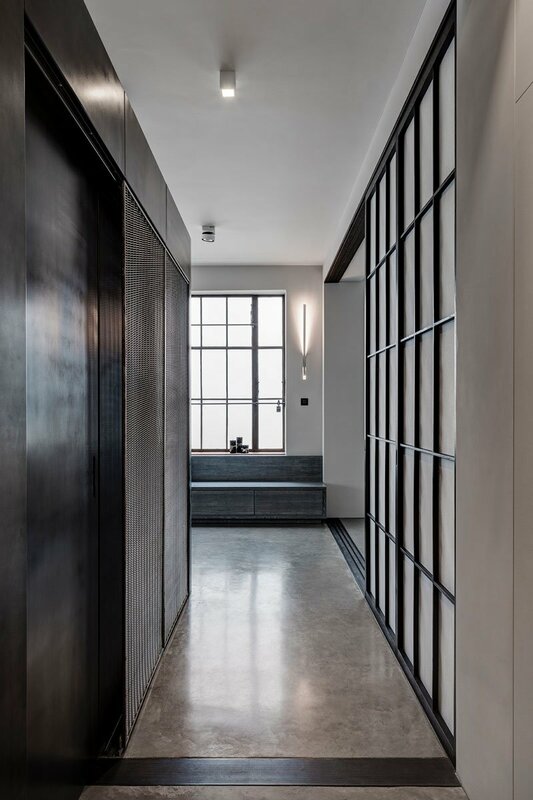 The existing window frames which work together on metal rods ‘in unison’ for ventilation are a complex but beautiful mechanical pivoting system which creates a raw and industrial aesthetic that retains a certain dynamic of movement, even when static. These themes permeated the design. Hard materials appear as soft as butter, soft fabrics are placed as monolithic stone-like structures. Lighting is varied, from muted & reflected tones to occasional directed, theatrical atmospheres. Isn’t this very amazing? I am sure you will agree with me that it sure is a lovely space! This is designed by APA who was able to give the clients what they want for a home. Well, they might even exceed the owner’s expectations. 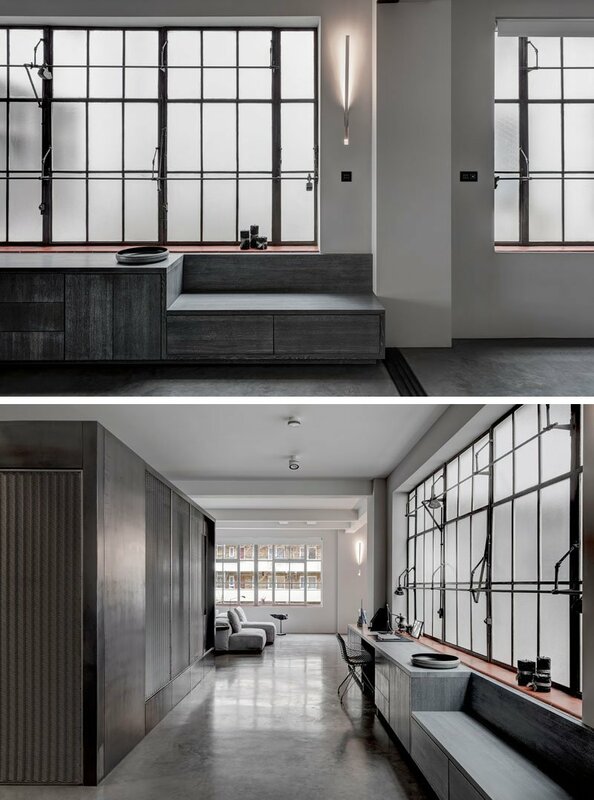 What I love in this house, apart from how nice the industrial look was executed, is the huge box which has so many functions. And yes, the windows definitely have some appeal too! How about you, what are the features of the apartment that you like the most?